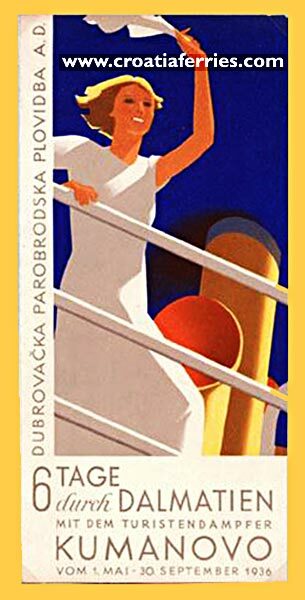 This is a scan of ferry brochure / flyer that advertises sailing for 6 days around Dalmatia by ship “Kumanovo” owned by Dubrovacka Parobrodska Plovidba . The flyer, printed in 1936, targets German speaking travellers saying ” 6 Tage durch Dalmatien mit dem turistendampfer Kumanovo vom 01.Mai – 30 September 1936″. Flyer includes timetables and prices too.